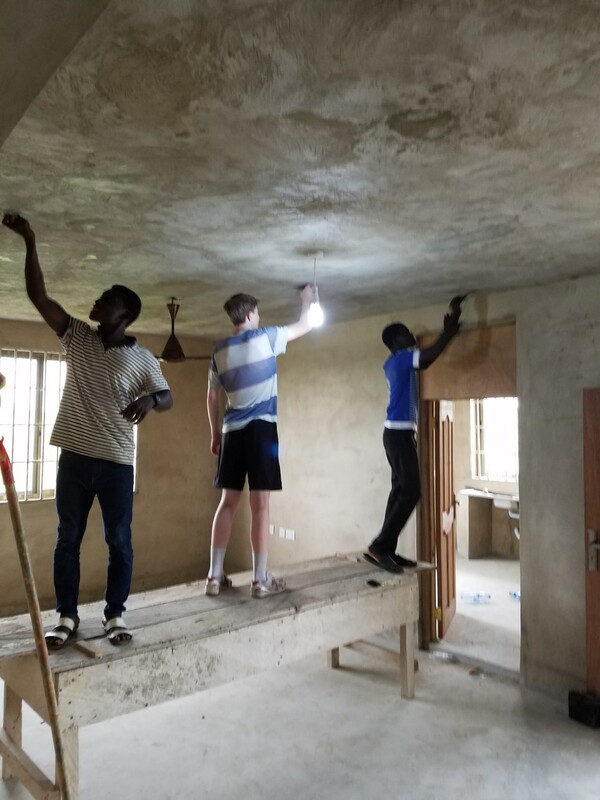 Shortly after arriving in Ghana, my wife informed me that she had put together a trip to take our family along with 8 local teenagers to help out at a Children’s Shelter called Ghana Make a Difference. The youth we went with are locals and have grown up living in a Liberian refugee camp in Southern Ghana. 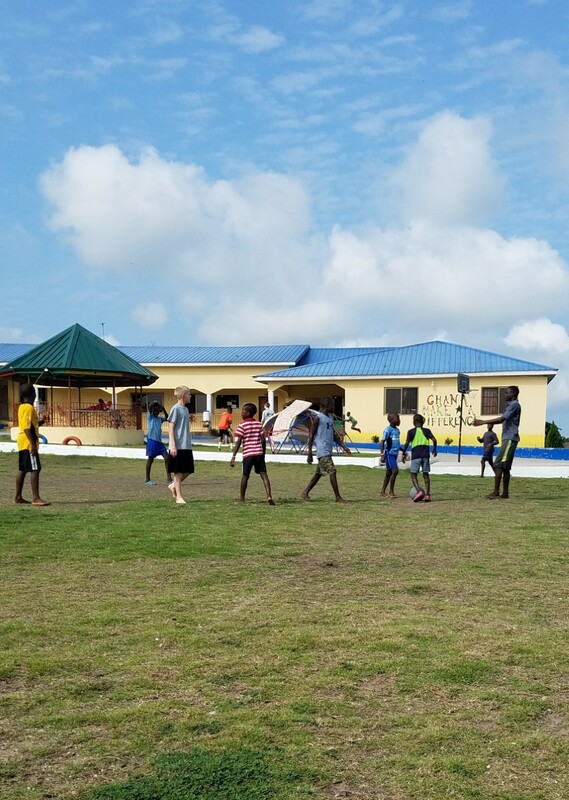 Ghana Make A Difference takes care of about 29 kids. The majority of them are young boys between the ages 6 and 13. It is not an orphanage but a temporary child shelter where the government will bring children who have been neglected, abandoned, or experienced all kind of abuse including child labor and human trafficking. GMAD is a big operation so there are many staff members and their families who also live there. 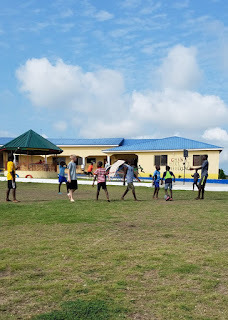 Our group of about 15 volunteers was there for 10 days and we got to stay in a separate building at their facility and they took good care of us even though we were supposed to be the ones serving them. 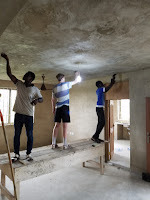 We were able to spend time playing with the kids, cooking, doing service projects like painting the new staff house they had just built, weeding, and moving building materials for additional structures they are building. In the evening, we would spend time with the youth we brought with us. We spoke with them about their future plans and what they wanted to accomplish. We also shared some skills and tools with them that will help them throughout their lives. While at the shelter I was amazed to see so many happy kids despite their circumstances. The facilities there are much nicer than any other type of shelter or care center here. It was clean, safe, well organized, and a very impressive operation. They teach the kids, feed them three meals a day, let them play soccer and other sports, and take them to church each week. It was a very inspiring experience to see all the good they do there. It was also nice to make new friends with the kids, staff members, and the youth we went with. This week’s topic may not be very exciting but it is one many people take for granted. I'd like to share some thoughts about laundry. After 25 years of going through many used washers and dryers, we finally bought a new washer and dryer and they were awesome, but I’m afraid they spoiled me. Here in Ghana we have a small washer but it is not very effective. I’m pretty sure it was made by Mattel or Hasbro and is the washer version of an easy bake oven. Washing clothes by hand isn't so bad since you can do a small load much faster than with a machine. I've done my own laundry since I was a teenager so I don’t have a problem with it. The challenge I’m having here is with drying the clothes after. 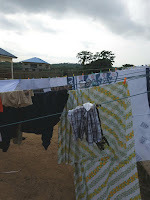 We hang our laundry out to dry but it can take a while with the humidity and rain. What bothers me the most is what happens to clothes when you hang them out to dry over time... STRETCHING! I experienced this many years ago when I was traveling around Europe for over a month and would wash my clothes each night in a hotel and then lay them out to dry. After several weeks, my clothes were stretched like crazy. My shirt collar was sagging half way down my chest and would easily slide over one shoulder if I wanted to go for that look. My poor shirts knew how it feels at Café Rio for a cute ball of dough to transform into a large tortilla. I'm not sure where that analogy came from, maybe because I'd love a Café Rio pork salad right now. Anyway, on that trip I ended up finding a laundromat in France and paid about $25 to do a load of laundry and use a real dryer and it was totally worth it. I recently realized that I love my synthetic, dry wicking shirts and can’t stand cotton anymore since it takes forever to dry and stretches out so bad. 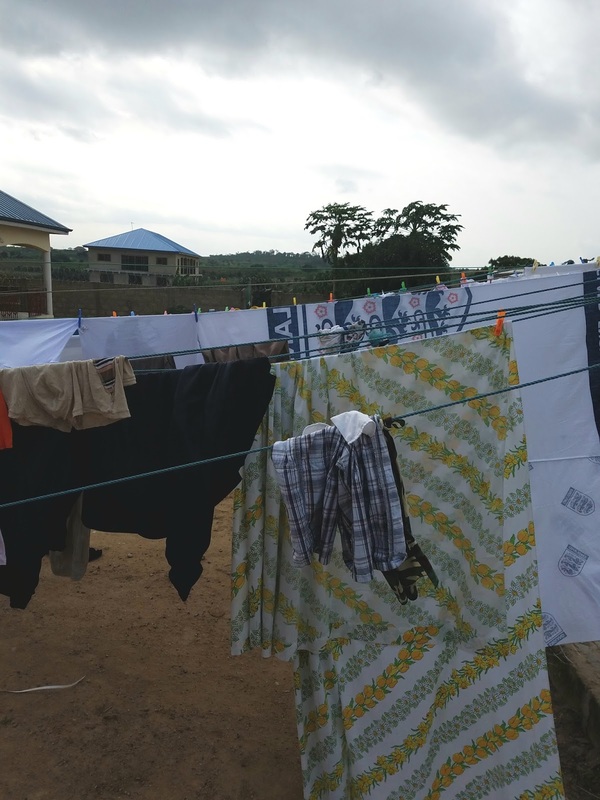 Our towels and clothes get clean but they are often hard and crunchy when they finally dry. Our laundry situation fits into a theme I keep seeing which is that everything takes so much more effort and time to do here. The next time you throw a load of laundry into the washer and dryer, remember how blessed you are to have a quick and easy way to have clean, soft, clothes that actually retain their original shape. I have been to many different countries over the years and experienced various cultures but the biggest culture shock for me upon arriving in Ghana was the traffic. The best way to describe it is "every man for himself", yet at the same time it is incredibly efficient considering what is happening. During the first day I grimaced and flinched in anticipation of multiple near accidents I witnessed, but by the second day I was just amused, and in awe with their driving. In the United States drivers are much more cautious, careful, and orderly, yet ironically we seem to freak out when there is an accident or go ballistic with road rage when someone cuts us off or wrongs us on the road. In Africa anything goes on the roads and everyone is pretty cool with it. While driving through the city it is normal to be cut off or run red lights (a mere suggestion) as long as you can see your surroundings and the other cars around you. Another thing that surprised me was the fact that many of the busy freeway speed roads have speed bumps on them every few minutes so if you are not paying attention you and your suspension will be in for a rude awakening. There are also a ton of police check points that slow traffic down along the way. Between the speed bumps, police stops, tolls, and single lane traffic full of potholes, it can take quite a while to travel on the road. I was wondering what side of the road they drive on before I got here. I now know the answer is both sides. Merging here is insane, yet a work of art. Scooters, pedestrians, cars, taxis, and trucks all come within inches of each other. As people try to pass each other and avoid pot holes it looks like a giant game of chicken. The big vehicles have an advantage since they win in the event of a collision, but the smaller vehicles are quicker and maneuver easier so they can get away with more. Despite the utter chaos traffic is surprisingly efficient. The video below is footage from a busy intersection in Ethiopia, so it's not from here but it pretty much gives you an idea what the driving is like here. The car horn is used as often as blinkers and a honk of the horn can mean a variety of things like warning a larger truck you are trying to pass them in their blind spot, notifying someone you are coming around a blind turn, saying hi to someone you know, or to tell a pedestrian to move over since they walk on the edge of the road and are mere inches from passing vehicles. We have a 15 passenger van we recently bought here since we have a large family and have service groups come over regularly so we need the seats but I am not looking forward to driving the beast in this free for all. We have hired several different drivers for long trips or to congested areas in town but my wife has been driving to church and other local errands on her own for a couple months now. Despite the crazy traffic, my biggest concern is the dirt road conditions. The city roads are mostly paved but we live on the outskirts of town so about 10 minutes of driving to our place is on unpaved red dirt roads that can wash out over time with the rains. Due to road damage, some of the turns have to be done slowly and resemble four wheeling in Moab. My kids have actually gone out with shovels on a couple occasions around our neighborhood to improve the road conditions. Anyway driving here is crazy but I'm also impressed with how well they do it under the circumstances. Hopefully when I return home I won't adopt the local driving habits here or I will end up losing my license within a week. I haven't written any posts on my blog for quite some time. Fortunately, I have recently made some major life changes that will provide some new content to write about. Rather than start a new blog, I have decided to use Chaka’s World as a platform to give updates about my family’s new adventure. This blog may not be as silly or entertaining as it used to be but it may be informative for family, friends, or unsuspected strangers who get rick rolled and diverted to this site. 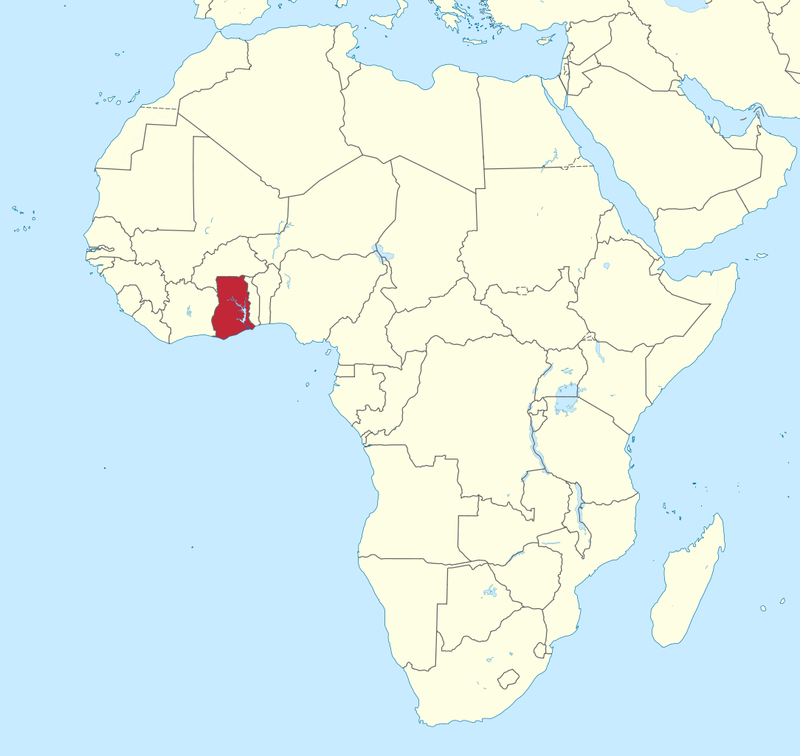 My wife and I recently made the crazy decision to move our family to Ghana for a year. One of my sons served a church mission there so we were somewhat familiar with Ghana. My wife originally went to Africa three years ago and has since started doing humanitarian work there and has been back six or seven times in the last 3 years. Rather than me holding down the fort at home with the kids each time she left, we felt it would be good to make a change and have the entire family go over together for an extended period of time. My wife and five youngest kids moved to the Kumasi area of Ghana a couple of months ago. I had to stay behind after they left to tie up loose ends and wait for our home to sell. Last week our home sale was finalized and I was finally able to leave. Just before leaving home I was looking forward to a final farewell basketball game with some friends I have been playing weekly ball with for many years. Within the first couple of minutes of playing I blocked a guy’s shot and came down and rolled my ankle on someone’s foot. I knew it was bad but decided to keep playing since it was going to be my last chance for good hoops for some time. I tightened my shoe and tried to walk it off and kept playing for two more games. I know that was stupid but it’s a guy thing. I finally couldn’t take the pain any longer and also realized I was not doing my team any favors by trying to hop around on one foot so I bowed out with a disappointing farewell game. 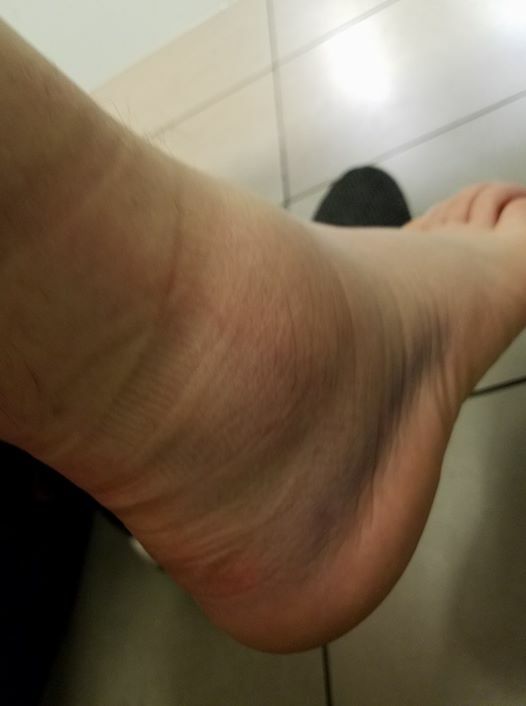 I flew out a couple days later and was sitting on planes or in airports for over 30 hours so the swelling got pretty bad. I’ve included a picture I took at my layover in Paris. I was mistaken for an elephant by a couple people. Lucking I found some compression socks in my luggage after I took this picture and it is slowly healing and doing better now. I arrived in Accra late Saturday night and was very happy to be reunited with my family. Each week I will either give an update or address a new topic from frequently asked questions I get the most from concerned people who wonder what we were thinking. I’m looking forward to sharing my thoughts regularly on Chaka’s world again.